Slide the keyboard down to add new parts and complete code-based challenges. The power and affordability of the Raspberry Pi has given rise to a new type of computer. One that goes beyond the credit-sized board, with colorful shells and displays that make it feel like a normal laptop or PC. The latest is the all-new Pi-Top, a modular laptop with a unique sliding keyboard. Pull it toward you and a large tray is revealed underneath with a Raspberry Pi 3 board and space for additional parts. The idea is to tweak and upgrade its innards for different coding projects designed by the Pi-Top team, thereby learning about code and electronics simultaneously. Pi-Top has experimented with this concept before. In December 2014, the company raised $193,000 on Indiegogo for its first do-it-yourself laptop. It was a functional, but unattractive machine with a cramped keyboard and small, right-aligned trackpad. A large, horizontal panel sat between the keyboard and the hinge, taking up valuable space. (You could keep your lunch there, I suppose.) To access the Pi and modular tray underneath, you had to pull the panel out through a slot hidden on the right-hand side of the laptop. It worked, but clearly the design had room for improvement. One year later, the company returned to Indiegogo and raised $220,000 for the pi-topCEED, a $99 desktop computer powered by the Raspberry Pi. The new Pi-Top is a slicker machine. It's a drastically easier build — six steps, rather than 23 — which might sound like a step backwards, but in return you're getting a design that feels more competitive with cheap Chromebooks and Windows laptops. It has a full-size keyboard and a centrally positioned trackpad. Above the hinge is a 14-inch, full HD screen that can tilt up to 180 degrees, besting the original's 13.3-inch display and 125-degree opening angle. Around the back, you'll find one ethernet and three USB 2.0 ports, a regular 3.5mm audio jack and a place for power. Slide the keyboard down and you'll gain access to the tray. This is where the Raspberry Pi sits, alongside a custom cooling system that Pi-Top claims will improve your productivity. If a Raspberry Pi runs too hot, it will start closing applications automatically. The Pi-Top's extra cooling should, therefore, stop this from happening, allowing you to multitask with fewer restrictions and sudden app closures. 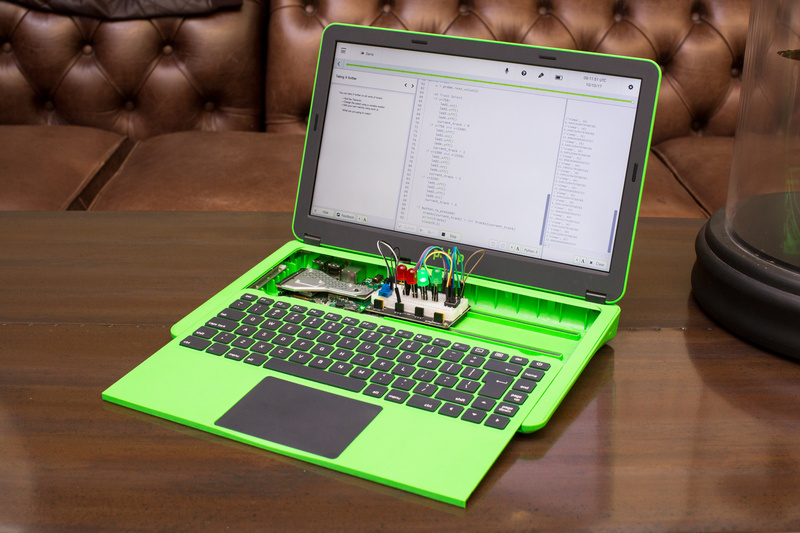 Each laptop also comes with an "inventor's kit" which includes a Pi-Top Proto Plus add-on board, LED lights, a microphone and motion sensor. Unlike the previous laptop, which required a screwdriver, they all snap into place magnetically. The inventor's kit unlocks three coding activities, or "journeys," inside the Pi-Top Coder app: Smart Robot, Music Maker and Space Race. The "Robot," for instance, is a boxy cardboard shell that sits on top of the Proto Plus. Using code, you'll adjust his blink speed, teach him to talk whenever you walk by, or make him think that he's being fed when you cover the proximity sensor. Each Pi-Top also comes with CEEDUniverse, a space exploration game that tests your creativity and problem-solving skills. You will, of course, be using and learning about code at the same time. The Pi-Top runs a custom operating system called Pi-TopOS Polaris. It runs some basic software including Google Chromium, LibraOffice and Minecraft Pi Edition. So while it can't compare to a Windows machine, it's possible that a child or student could use it as their first laptop. The sticking point is the price: the new Pi-Top costs $320, or $285 without a Raspberry Pi. That's expensive for an arguably underpowered laptop. In exchange, of course, you're getting a device that's easily customisable. You can upgrade the Pi board whenever you like and use external components in the tray (I'm told it's possible to add a BBC micro:bit, for instance). The laptop faces fierce competition from Kano, however. The London startup, which has a range of built-it-yourself coding kits, announced a "laptop" bundle last month that includes an all-in-one display unit and wireless keyboard. It doesn't offer much in the way of hardware customisation, but is powered by Pi and offers similar learn-to-code software. (It's also compatible with Kano's standalone coding kits, such as the Pixel.) The "Computer Kit Complete" is also $50 cheaper than the Pi-Top, which might give parents pause while browsing for Christmas gifts.